Null-F - ZineWiki - the history and culture of zines, independent media and the small press. 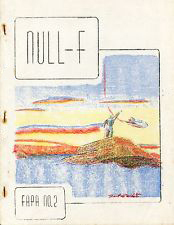 Null-F was a science fiction fanzine by Ted White. Null-F, published in Brooklyn, New York, U.S.A., was originally produced for Offtrails Magazine Publishers Association. Issue 2 was released in 1956. It was also distributed through Fantasy Amateur Press Association, APA-F, and APA-L. Issue 41 was published in 1965. Issue 51, appearing in February 1975, was the twentieth anniversary issue and the final issue. 51 issues were produced between 1955 and 1975. Contributions of artwork came from Ron Archer, Lee Hoffman (The Chattahoochee, Okefenokee, & Ogeechee Occasional Gazette, Chooog, Fanhistory, Quandry), Dan Steffan (Boonfark), Charles Wells (Fiendetta), Ted White, and others. Contributions of writing came from Jack Harness (ZIUQ), and others. Ted White had previously been one of the co-editors of Void and Stellar in the 1950s; in the 1960s he published Gambit, and in the 1990s co-published BLAT! with Dan Steffan. This page was last modified on 9 March 2015, at 11:28.